Justin Trudeau visited Rowan Gillespie’s Famine sculptures on Dublin’s Custom House Quay. 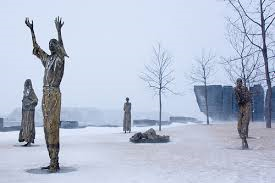 The monument is twinned with Ireland Park in Toronto which also has Gillespie Famine sculptures. Ireland Park Foundation CEO Robert Kearns and Rowan Gillespie accompanied the Prime Minister. New Irish-Canadian Famine Research presented at iNua Partnership Ireland Park Foundation Event. 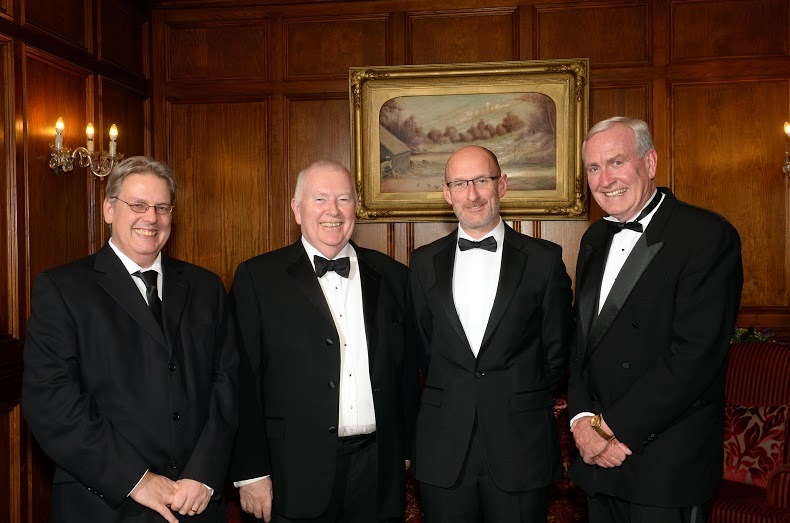 Pictured at the Ireland Park Foundation Toronto / iNua Hospitality fundraising evening in The Muckross Park Hotel were from left, Jason King, Robert Kearns, Ireland park, Noel Creedon, Inua and Kevin Vickers, Canadian Ambassador. The Ireland Park Foundation in Toronto, is a charitable non-profit organisation set up to commemorate and celebrate the story of the Irish in Canada. On Thursday, 24th September 2015 iNua Partnership hosted a gala dinner for Ireland Park Foundation, a charitable non-profit organisation set up to commemorate and celebrate the story of the Irish in Canada. As a specialist investment company with deep ties to Canada, iNua Partnership is the Foundation’s first corporate partner in Ireland. The partnership was officially announced by his Excellency Kevin Michael Vickers, the Ambassador of Canada to Ireland, at his residence in Dublin on April 2015. The Ambassador attended the Dinner as special guest and was joined by over 200 guests from the spheres of business, the arts and politics at the Muckross Park Hotel, a luxury 5 star hotel in the heart of Killarney National Park bought at the beginning of 2015 by iNua’s investment vehicle, iNua Hospitality. The event celebrated social, cultural and economic interests and generate much-needed funds for Ireland Park Foundation. Ireland Park Foundation was established in Toronto in 1997 by Irish entrepreneur and businessman Robert G. Kearns who emigrated to Canada in 1979. Mr Kearns said “Ireland Park Foundation is delighted to reach out to our Irish community to celebrate the deep historical, economic and cultural ties between Ireland & Canada. This has only been made possible by the generous support, vision and enthusiasm of Noel Creedon and his team at iNua Partnership. Noel Creedon, MD of iNua Partnership said “The ambition is for this to be an annual dinner as part of our collaboration with Ireland Park Foundation, a partnership which aims to raise awareness and understanding of the Foundation here in Ireland and to strengthen the connection of Irish people living in Canada to business, cultural and political circles back home.” NUI Galway’s Dr Jason King, who has been commissioned to conduct new research to help uncover the personal stories of some of the thousands of Irish men, women and children who left from Cork and Limerick for Canada during the Famine years, presented his finding to the guests at the Dinner. All proceeds raised from the event were donated to the Foundation. Here, in Killarney, we have one of the most poignant memorials to these unknown children of the Famine. If you have some time tomorrow, I would urge you to visit St. Mary’s Cathedral – regarded as Pugin’s finest – which served as a hospital, a place of worship, and a burial ground for workhouse children long before it was completed in 1855. The burial ground is marked by a soaring redwood tree which provides a fitting place to reflect upon the fate of the unknown children of the Famine. Redwood Memorial for Children’s Famine Grave, St. Mary’s Cathedral, Killarney. 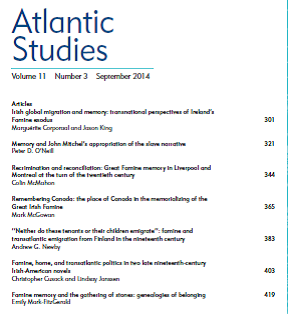 The difficulties in tracing Irish Famine orphans make it appear all the more remarkable when we discover survivors who not only started new lives but new family lines in Canada with many living descendants. Although the fate of Thomas Tracey remains unknown, his seven year old sister Bridget Ann settled in Whitby, Ontario, and she had children, grand- children, and great grand- children, including Terry Smith who is a board member of Ireland Park Foundation. Bridget Ann Tracey brought with her to Canada a gold painted cream jug as a keepsake of her Irish homeland as well as stories of her transatlantic crossing passed down through generations which both remain largely undiscovered famine legacies. As he lay dying on Grosse Ile, Quebec, in the summer of 1847, James Quinn from Strokestown, in county Roscommon, implored his two young sons Patrick (12) and Thomas (6) to “Remember your soul and your liberty”. Both orphans were adopted by a French-Canadian family and honoured their father’s memory by becoming priests who served mixed French and Irish Catholic congregations. In 1912, Thomas Quinn stood before the First Congress of the French Language in Canada in Quebec City to thank the Canadian people for their “untiring charity”. This too is an unknown legacy of the Famine and our shared Canadian and Irish heritage. In the town of Richmond Quebec, the descendants of Irish Famine orphan Charles Coote, from Cootehill in County Cavan, treasure a handwritten account of their ancestor’s perilous transatlantic voyage on the Odessa, during which his father Samuel, mother Margaret, and sister Ellen all perished between mid-August and the first week of September in 1847, “their new world adventure ending at their first sight of Canada”. And finally, let us not forget the story of William Vickers and the Vickers brothers who emigrated from Ireland in 1848 to the Miramichi in New Brunswick, whose descendants include our distinguished Canadian Ambassador, Kevin Vickers,who is here with us tonight. The story of his ancestry is also too little known as a Famine legacy. Ireland Park Foundation and iNua Partnership are to be commended for bringing these stories together. These narrative traces of Irish Famine orphans help remind us that similar stories are being created today. In marking their legacy, however, much work remains to be done. In the past six months, Ambassador Vickers has launched the Ireland Park Foundation iNua Partnership, the Irish Famine Summer School at the National Famine Museum in Strokestown, the Digital Irish Famine Archive at NUI Galway, and he opened Canada’s Irish Festival on the Miramichi at the former quarantine station of Middle Island, New Brunswick. He has helped to define a national vision and field of remembrance of the Canadian Famine Irish. And yet, for scholars and travellers who wish to follow in their footsteps, the resources and way markers that exist remain all too fragmented. 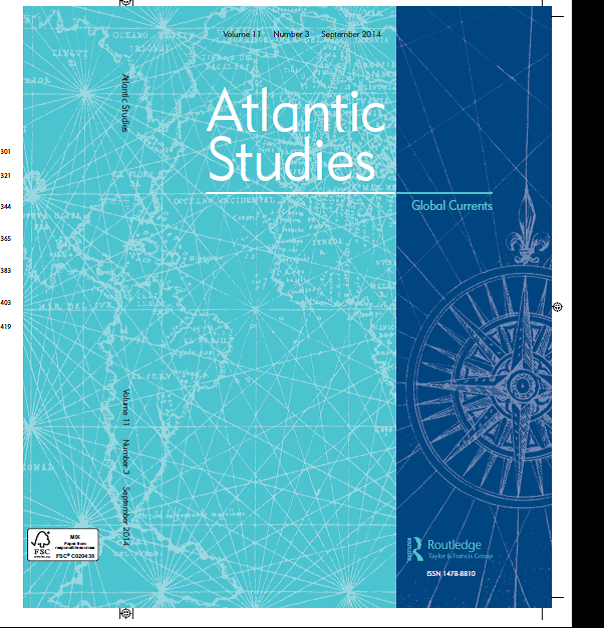 There are no less than four digital archives that contain the records of the Canadian Famine Irish between New Brunswick and Toronto with no single, integrated, interoperable collection for scholars and the public to consult. For travellers who wish to follow in the footsteps of the Famine Irish from Middle Island on the Miramichi, to Grosse Ile and the Black Stone in Montreal, to Kingston and the ultimate destination of Ireland Park in Toronto, all easily connected by VIA Rail, there is no single guiding authority to help way mark this national Famine Irish trail. And here, in Killarney, we dine tonight in one of the main destinations of the magnificent Wild Atlantic Way, which is replete with Famine sites from Donegal to west Cork. 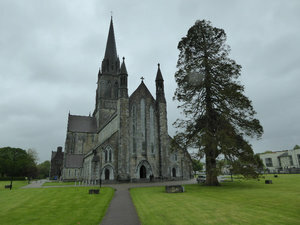 Between the three iNua Partnership hotels in Limerick, Killarney, and Cork, this trail wends its way past Stephen De Vere’s home in Curragh Chase National Forest Park, the ruined famine villages of Dingle and Ballinskelligs on the ring of Kerry, past the poignant redwood memorial here at St. Mary’s Cathedral, and on through west Cork to the blighted and iconic town of Skibbereen, first made famous by future Canadian Governor General Lord Dufferin in his harrowing 1847 book entitled From Oxford to Skibbereen. Yet there is little to help familiarize travellers on the Wild Atlantic Way with these numerous Famine sites in their midst. The time has come to consolidate these projects, digital archives, and heritage sites into a single field of vision and research on the Famine migrants that will honour their legacy and trace their crossings between Ireland and Canada and all of their myriad movements between our two countries. In the 19th century, Toronto was overwhelmingly British and Protestant, a bastion of WASP burghers for whom Queen and Empire were watchwords and ethnic uniformity was a given. And then there were the Irish. Yet by the time of the First World War, the Irish had largely blended in to the city’s mainstream. In a Toronto where marginalization of ethnic minorities remains a live issue, the integration of its Irish population in the 19th century may provide lessons, and some hope, for healing the city’s divides. Interviews with historians, contemporary newspaper accounts, and the academic literature on the period paint a dire portrait of Victorian Toronto’s intolerance and inequality. While the city had long been home to a smattering of Irish immigrants, the summer of 1847 saw a deluge: 38,000 between June and October, driven across the Atlantic by a potato blight that was starving the country. Just about 2,000 of those “faminities” wound up staying in the city — the rest spread across southern Ontario and farther afield — but in a city of about 30,000, the Irish influx was huge. By 1851, a quarter of the city’s population was Irish Catholic. The virulent anti-Catholicism of many Protestant Torontonians compounded the difficulties of accommodating so many newcomers. Long a feature of British nationalism, hostility toward Roman Catholics was accentuated in the 1850s and 1860s by Irish republicanism and Fenian unrest in the British Isles and North America. Some malnourished Irish died of typhus and other diseases on the way to Toronto. Those who survived often found themselves unwelcome and discriminated against, despised for their poverty but refused when they sought jobs. In Toronto, the anti-Catholic mood was deepened by lingering resentment over the grafting together of Anglo-Protestant Upper Canada and French Catholic Lower Canada in 1840. George Brown, a leading Grit politician and founder of the Globe newspaper, channeled this sentiment in frequent broadsides against the city’s Irish immigrants. Brown’s vitriol contained a disquieting kernel of fact: many of the Irish who came to Toronto were desperately poor, especially as the famine dragged on. The city was soon dotted with Irish Catholic enclaves. Corktown, named after Ireland’s County Cork, was one such neighbourhood. Nearby Cabbagetown held a higher concentration of Irish Protestants, sparking occasional turf skirmishes. Writing of his Toronto childhood, Cabbagetown native and Globe and Mail columnist John McAree remembered the animosity that bristled between the rival territories. The Orange Order, a Protestant fraternal organization founded in Northern Ireland at the end of the 18th century, held inordinate political power in Victorian Toronto. Between 1845 and 1900, all but three of the city’s mayors were members of the Order. July 12 marked the annual commemoration of the Battle of the Boyne, a crucial 1690 military victory for William of Orange over the Catholic James II, which ensured Protestant supremacy in Ireland. It was one of Toronto’s sectarian holidays that periodically turned violent. By one count, Orangemen and Irish Catholics did battle 22 times between 1867 and 1892, often on July 12 or St. Patrick’s Day. But occasional outbursts of communal violence may not have been as harmful as the steady day-to-day onslaught of discrimination the Irish faced. Access to government jobs in the police and fire services was often controlled by Orangemen, foreclosing the route to middle-class prosperity taken by so many Irish Catholics in Boston and New York. Private companies were known to maintain informal anti-Irish hiring practices, too. Having a southern Irish accent would have been an impediment to landing a job on the Eaton’s shop floor, McGowan said. 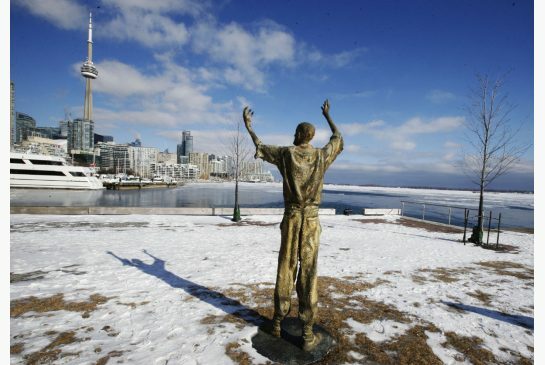 The statues in Ireland Park hidden away at the foot of Bathurst and Queens Quay represent the struggles of Irish immigrants fleeing the potato famine around 1847. So how did the Irish emerge from a climate of poverty, hostility and violence that too often defined their lives in Toronto? A range of factors contributed, of course, some hard to replicate in modern-day Toronto, but others more readily at hand. It surely helped that the Irish spoke English, allowing them to sidestep the language barrier that would slow the integration of later generations of newcomers. Physical mobility was another Irish advantage. Corktown and neighbourhoods like it may have served as landing pads for the new immigrants, but they rarely stayed in one place for long. “By the 1890s, they’re everywhere,” said McGowan, himself descended from famine refugees. “If you went to an American city, there would be these long-standing Irish enclaves. You don’t have that here.” This geographic dispersal helped bring Catholics and Protestants into closer contact, driving mutual understanding and even encouraging intermarriage. “Cupid was probably more important than denomination at a certain point,” McGowan said. At the same time, immigrants from other parts of the world began trickling into Toronto, loosening the Irish monopoly on the fears and resentments of the WASP majority. “From the 1880s, Toronto started getting immigrants who were even more scary from the majority perspective,” said Allan Levine, author of Toronto: Biography of a City. In the meantime, the community was working doggedly to improve its lot. Mutual aid societies, church parishes, sports teams, card parties, and temperance leagues created a thick support net for Catholics trying to climb the social ladder or simply to avoid destitution. This network could be surprisingly thorough, covering expenses that even the modern welfare state neglects; the Bona Mors Society, for example, helped defray the costs of Irish Catholic funerals in Toronto. The most important of the civil society institutions was Catholic schooling. Since the 1840s, the Upper Canada government had extended funding to separate Catholic schools, an arrangement enshrined in the British North America Act of 1867. Meanwhile, Catholic kids could get excellent post-secondary instruction at St. Michael’s College, which only formally federated with the University of Toronto in 1910. All that education led gradually to professional, middle-class jobs. “The generation of maids gives way to a generation of lower-level clerks, firemen, skilled tradesmen,” said Jenkins. Eventually those clerks became barristers and bureaucrats. 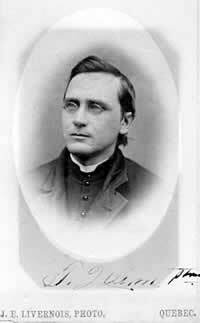 As McGowan pointed out, James J. Foy, a Catholic lawyer and alumnus of St. Michael’s College, became a leading Tory politician and right-hand man to premier James Whitney at the turn of the 20th century. By the 1910s, McGowan notes, the Orange Order and the Catholic Holy Name Society were able to hold marches through Toronto without incident. Of course, that was six decades after the first significant wave of Irish immigration to Toronto. One of the sharpest weapons against Irish marginalization was time itself. “If you’re looking at the famine Irish, by the 1890s, you’re looking at a community that’s been here for 40 years,” McGowan said. Through the accumulation of hard, impoverished decades, the Irish not only made themselves part of Toronto’s social fabric, they expanded the idea of what that society could be. The Irish conception of their place in Toronto “wasn’t the imperial nationalism of WASP Canadian identity,” said Jenkins — it was more liberal, more ecumenical, less British. What happened to Thomas Treacy? Our readers tell us about heirlooms, photos and other mementoes that evoke the city’s past. In the summer of 1847, a seven-year-old orphan, Brigit Ann Treacy, arrived in Toronto half-starved, but carrying a small treasure – a gold-painted cream jug which was her sole keepsake from her home in Ireland. Passage on the famine ship Jane Black had been perilous; there was little food or water. Brigit Ann had been so hungry she’d chewed on her leather shoelaces. She was travelling with her aunt, Peggy Ryan Clancy. There was to have been a third passenger, her younger brother, Thomas, but he disappeared in the chaos of boarding ship on the docks at Limerick. It’s not known what became of him. Aunt and niece settled in Whitby, where Peggy worked as a cook. Brigit Ann grew to be a beautiful young woman who one year was named the “belle of Whitby,” her great-granddaughter Terry Smith recalls. Smith, a former Ontario deputy-minister of culture, has inherited the creamer, which she keeps in her grandmother’s china cabinet. She runs a company, Philanthropic Partnerships Inc., which matches donors with charities, and is the only famine descendent on the board of the Ireland Park Foundation, which is creating a park scheduled to open at Bathurst Quay in June. Brigit Ann was one of the 38,000 Irish immigrants who landed in Toronto in 1847, having fled the Irish potato famine, which killed one million people over six years. Many arrived at the docks sick with typhus; 1,110 died by the end of 1847. The story of her great-grandmother’s arrival and survival, told through generations in her family, is also the story of the settlement of Canada, Smith says. Brigit Ann married Michael John McTague, another Irish immigrant, and had four children, including Norah, Smith’s grandmother, who raised nine children. Smith has traced more than 200 of Brigit Ann’s descendants in Canada and the U.S.
“This little jug reminds us all where we came from and the struggle our ancestors took to make a new life here,” she wrote in a note to the Star. Last fall Smith and her sister Sheila Kirk found Brigit Ann’s tombstone in St. Michael’s cemetery near Yonge St. and St. Clair Ave. She died in 1924, when she was 84. Brigit Ann’s aunt, Peggy, lived to be 103. But there are still unknown elements in this story. Smith still wants to find out what happened to Brigit Ann’s brother, the little boy who was lost or left behind at the docks.